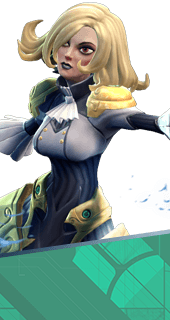 Phoebe is a Hero in Battleborn. She is unlocked at Command Rank 22 or by killing 50 enemy players. Phoebe swipes at enemies and activates her high-tech formal wear to propel herself in any direction. Phoebe's primary attack chains multiple melee-range sabre strikes, while her secondary attack launches her in a direction, dodging incoming attacks. After a brief charging period, Phoebe teleports to a target location. Phoebe launches a barrage of four charged rapiers, each dealing 52-70 damage. Conjures a storm of falling rapiers dealing 505-730 damage over time to a large area. Phasegate creates an electric storm at Phoebe's destination, damaging nearby enemies. +160 Damage. Phasegate creates a field at Phoebe's target destination that slows nearby enemies. +6 Seconds Slow Duration. Blade Rush blades explode on contact, damaging nearby enemies. +12% Bonus Damage. When Blade Rush hits an enemy, the skill's cooldown is reduced. Increased effect on enemy Battleborn. Battleborn: 1.5 Seconds Per Hit, Minions: 1 Seconds Per Hit. Landing a hit with True Strike increases Phoebe's defense for a short time. +30% Damage Reduction for 3 Seconds. A portion of Blade Rush's damage bypasses enemy shields. +60% Shield Penetration. Increases shield recharge rate. +105 Shield per Second. Adds a portion of Phoebe's current shield strength to Blade Rush as bonus damage. +12% Current Shield as Damage.